It was mid-morning as the plane banked for one last time and settled down to its long approach. Small clusters of houses, woods with arterial bike tracks and capillary branches, fields with horses gathered in anticipation round feed stalls. Each growing bigger in the plane window by the moment. Each adding to a patchwork countryside typical of a city edge. Greens. Browns. Off-white buildings flanked by regulation lawns. A football pitch, where dozen of kids chased a ball: ebbing and flowing, a school of little fish. Factories and shopping centres. Normally the houses seem to go on for ages and ages, as if the whole land is swamped in urban sprawl. But this is different. Just over there are hills, and beyond those, more hills. I suspect – maybe imagine – the glitter of water, spreading wide and long in valleys still rebounding from the loss of ice. This is not London with its gentle, rounded hills, this is Glasgow with its views to the highlands and its hints of lochs. This is not England. This is Scotland. This is not homecoming, but a form of out-going. A journey to a place that is, once again, embracing its difference and finding that this difference is good. When you travel for business, but don’t travel Business, there are few better things to see the your name written on a board, where a friendly face offers help and guidance. And above all else, offers an easier journey to your hotel. Whoever said it was better to travel than arrive, never went through the long night of Economy on the way to Dubai, or the endless daylight beyond it. I knew what to expect in Glasgow. Grim rundown old place. The ghosts of industry. A place that once built ships but did not anymore. A place to be before I went somewhere else. I had seen the pictures on the TV in the 1980s, so what more was there to know. I had the clear-eyed benefit of belief without the baggage of evidence. I knew what to expect, and expected to see what I knew. Maybe I should have taken the weather as a sign; clear blue skies unending. Early summer warmth. Swallows rushing past leaf rich trees, a magpie calling from a windowsill. 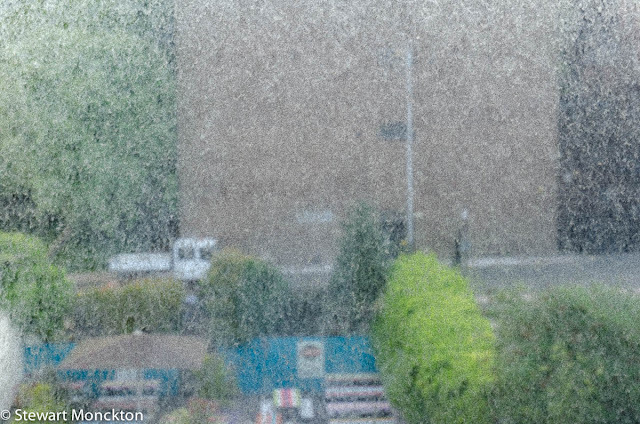 The taxi driver laughed at the weather and said it would be raining soon, as was right and proper for June. He mocked the weather forecasters for suggesting the sun would shine and shine and shine. And that the rain would stay away. Jackdaws pecked at scraps on the side of the road. Gulls swirled over the Clyde. And the sun kept shining. Two bright and shiny buildings sat by the river. The Armadillo and The Space Ship. The driver slowed for me to get a better view. If the Armadillo – really the Clyde Auditorium – had uncurled and walked off I would not have been surprised. But then it struck me. The buildings were bright and shiny. There were apartments being built, and the sun was still shining. The taxi turned right onto a down slope. A church of fine red stone stood across the far end of the road, and on both sides tall buildings of the same red rose up from the wide pavements. In George Square, a large public space, tall statues and neat grass were studded with pigeons and people eating an early lunch or a late breakfast. The taxi stopped outside an old industrial looking kind of building; the doors to the inside were wonderfully designed of old wood and new steel. Reception was staffed by a sane collection of blue eyed eastern European and authentic locals with poetry in their accent. I was offered a tea, for which I was thankful, and when it arrived, it was in a mug; “The cups are too small for a decent cup” I was told and I found myself in total agreement with the sentiment. But something was not working; something was remarkably and deeply wrong. This was not the Glasgow that I knew existed. This had to be somewhere else - maybe Edinburgh with its festival cool, or Aberdeen with its….. whatever Aberdeen has. This could not be Glasgow. What I saw and what I knew were clashing in a way, which compounded by jet lag, brought my confusion to almost fatal levels. I was in that political dream state of the current age where knowledge is unhindered by experience, and certainty never challenged by evidence. Opinion, being far more important than the mere empiricism of measurement, meant that what I was seeing must be wrong. I shook my head and went in search of my room. The outside of the room’s single window was deeply speckled with dust and dirt, breaking the view in to a broken patchwork that hid the details of the buildings and courtyards behind. The nearest rooftop sprouted a small tree and a few tiles were missing, slid off by winter storms or pushed off by the growing Ash. Beyond that building was the back of a pub, where wide wooden tables were laid out with glasses and plates of food. This was more of a vision of the truth that I knew to be true, and feeling slightly superior I took a shower. An hour later I was back in George Square, where more people had gathered to soak up the sun and meet with friends. On the outside wall of the Guilds Hall a metal plaque held a set of standard measures – one foot, two feet, a yard – and the back of a war memorial recalled the number of people from Glasgow who had died 100 or so years ago. Measurement and numbers. Facts and figures. I think this may have been some form of sign as well. I picked a sunny spot – and there were plenty to choose from – and tried to let the daylight reset my biological clock. Tour parties came and went. People took selfies and flashed peace signs at family cameras as they stood in front of the War Memorial. 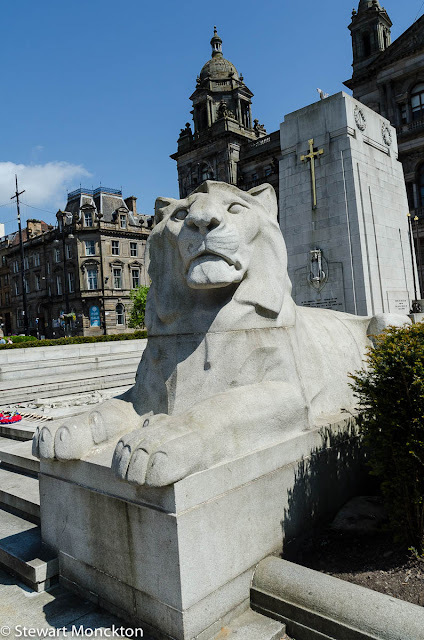 Kids climbed on the feet of the imperial lions that guarded the flanks of the memorial. Adults walked past the ‘please do not enter’ signs to get a better shot of the catalogue of the dead, a digital memory, lest we forget. I find such things disquieting. 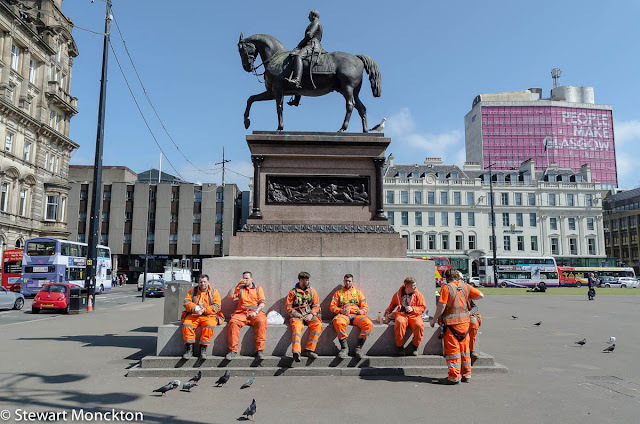 At the other end of the square, away from the Lions and the cross of remembrance, a group of workmen, striking in bright orange, eat lunch below a statue. Nobody seems keen to be photographed in front of them, preferring the memory of the past, to a vision of modernity. Maybe it’s the spirit of the age. I walk away from the square, following my nose, looking for the river. Many of the buildings are grand in a way that I find surprising. Elegant, if a little time worn, and red. Warm. Intricate. The detail speaks of a history I do not know about, when the profits of industry must have stayed in the city rather than disappearing off shore in the digital brown paper bags of modern banking. I find the river more by Zen than navigation, walking down unfamiliar roads, hoping that my foreignness does not show too much. The Clyde is wide and brown, overstepped by bridge after bridge and often hidden behind high walls and cut off by fences. At least in the sections I saw, Glasgow still seems to look to its warm red stone, than the flow of its river. There are more buildings here in need of care than in the city center. Nobody seems to be stopping for lunch. Gulls gather and fight over unseen scraps, mallard spin in circle eddies by the shore. The sun keeps shining. I talk to a street-sweeper who bemoans that senseless violence of the bottle smashers; people who throw their empties at walls rather than place them in the bin. This was my first, and certainly not my last, encounter with a kind of conversation humor that was as refreshing as it was unexpected. I’m a serial conversation starter – and here, for once, I seemed to fit in. The sunlight had not yet woven its magic on my biological clock and my eyes were closing despite the hour. I had landed in Glasgow in full possession of a Fox News kind of certainty – one that was firmly rooted in a world where fact and fiction are indistinguishable, and all you need to know is that your own beliefs render things to be true. It was a kind of Magical Thinking that surprised me when I saw it for what it was. Knowing most of what I knew of Glasgow was wrong, and wondering what was true, I turned my back on the river and walked back towards the center of things. Thanks for the trip to Glasgow, Stewart. Your excellent word craft took me to a part of the world where my ancestors walked but I will likely never see in person. Really enjoyed your post. Hi. I think Scotland and Glasgow is a magnificent place. Greetings. 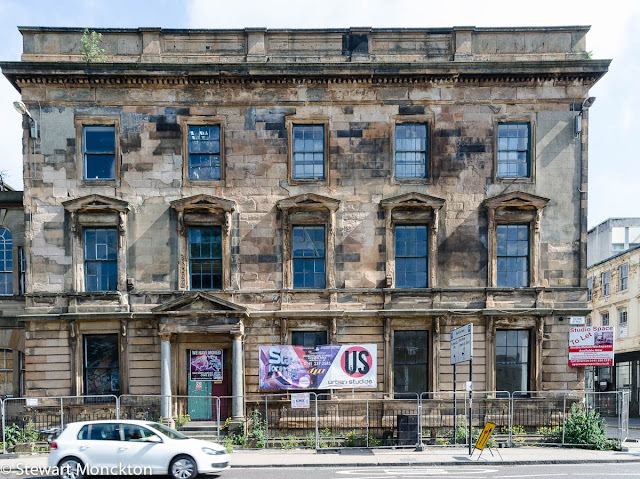 You paint a beautifully realistic picture of Glasgow, a city I will probably never see (even though I am a bit of Scotch-Irish) because it is low on my Bucket list and time is short when you reach my age. I loved your choice of pictures ... they seemed to echo the words you spoke and I especially loved that you are aware that Fox News is more Fiction than truth. I am still waiting for that book you are going to write ... is it in the offing? Love the shot of the workmen. Clever title! Yeah, Fox news drives me crazy. Such a nice piece on Glasgow. I’ve always wished I could visit Scotland as I have seen so many beautiful pictures of it. I think I’d have a hard time understanding their accent, though. Your Glasgow had changed, and for the better. Mmmhmmmm... Glasgow is beautiful--even if getting there is awful. Thanks for sharing your journey with us! It's so interesting to see and hear another persons view of Glasgow. 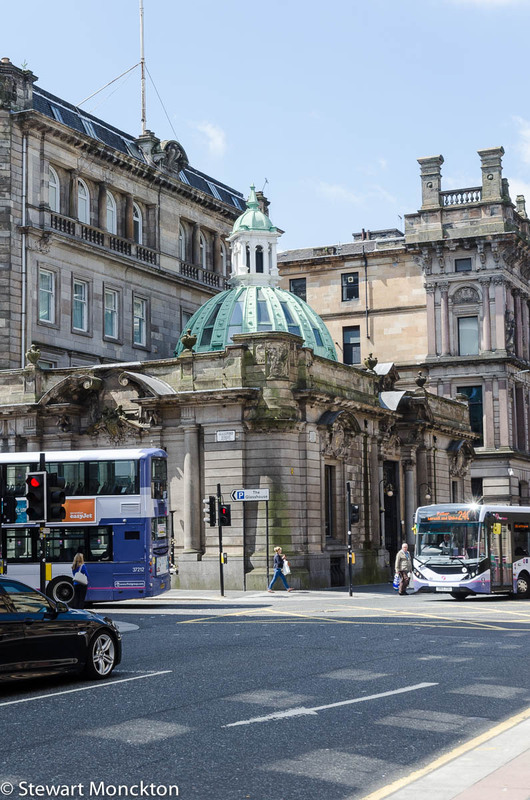 I've travelled there any times arriving into Queens Street station, which is near to George Square. I wonder if you saw the equestrian Wellington Statue, most often featured with a traffic cone on its head, on Royal Exchange Square. It's now a tradition no matter how many times the cone is taken away... there's an outcry to replace it! 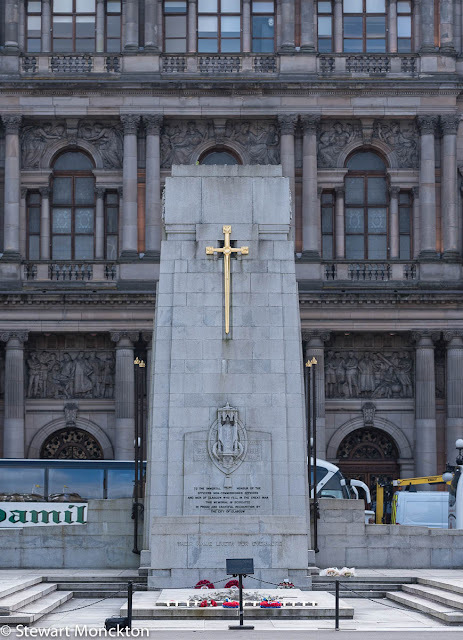 It's now one of the iconic sights to Glasgow. Strange but true!